The biggest thing you should bear in mind before you start the tattoo removal process is that no tattoo removal procedure is guaranteed. You should speak to more than one laser treatment expert so they can give you realistic expectations. Your tattoo might partially fade and leave a ghost image, or you could have raised scarring left. 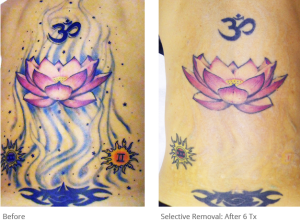 You have to ask yourself if you would rather do a cover up, or finish the treatments with a partially faded tattoo. You may notice a darkening effect in the area of the tattoo that just had a laser removal treatment. This darkening effect happens because of the titanium oxide in the tattoo ink. The inks can also contain iron, and these colors tend to turn gray or a darker color. This will eventually resolve itself, but it will remain darker as long as you have the treatments. People who have darker skin tones can get tattoo laser removal treatments as well. However, they are also at a higher risk for having permanent skin lightening or hypo-pigmentation. This phenomenon occurs because the laser removes both the tattoo ink and the pigmentation from the skin. Your doctor or laser tattoo removal expert should do a small test spot before doing a whole treatment to see how your skin reacts. Tattoo removal requires several treatments, and the number of sessions can’t be predetermined by the expert at your initial consultation. The average estimate is six to ten treatments, but this figure could be much higher. You also have to take downtime into consideration. If you rush the treatments, you might have open wounds or sores left in the treatment’s wake. Treatments are spaced, on average, four to six weeks apart. There are cases in which eight weeks between treatments are recommended, but everyone is different. This wait time can be longer if you experience side effects. How successful your tattoo removal process is, in the end, is primarily based on the tattoo itself. Two major points to consider are which colors were used and how deep the ink went. A professional tattoo goes into the skin the same depth, which gives it a uniform color and makes it easier to treat. On the downside, a professional tattoo is also more color saturated, and this presents a challenge to remove it. Amateur tattoos are put into the skin unevenly, and this can be challenging to remove, but overall they are easier to fade. The most common reported side effect of laser tattoo removal is lightening, or darkening of the skin in the area the laser worked on. This condition usually returns to normal six to twelve months post-treatment. There is also a chance for scarring, burns, infections, and texture changes to the skin. In many tattoo removal situations, location isn’t that important. It is important to note that tattoos that are farther down on your arms and legs will take longer to fade. The closer your tattoo is to your heart, the closer it is to the main point of circulation, and the better the results will be. Your ankles are particularly bad for tattoo removal. There are several lasers available for tattoo removal. They have different wavelengths and work better on certain colors. The PicoSure laser applicator has emerged as a leading tattoo removal laser in the past few years. PicoSure has three wavelengths available, and which one is used to fade the tattoo depends on the color. There are still several treatments used to remove the tattoo, but the results have improved drastically in recent years. You may also use a mix of lasers for the multiple colors. Post-treatment, there are several signs and symptoms you should watch out for. The symptoms are listed below. All of these symptoms are typical post-treatment, and they usually subside within a few days or a couple of weeks. If you have questions or are concerned, talk to your family physician. When laser tattoo removal is performed by a doctor or laser removal technician, it is a safe procedure. If you have questions, don’t be afraid to ask them. Also, ask about any side effects, risks, or symptoms to watch out for during or after treatments. You should ask to see before and after photos of people whose skin types are close in color to yours. These photographs will give you an idea of what the complete tattoo removal will look like. Tattoo removal can seem like a long and painful process. It has improved over the years, and it is now an option for many people who have tattoos they regret. If you follow all of these tips, you will be able to set realistic expectations and have the best outcome possible.